On February 7th, my book “Getting Started with Varnish Cache” was released. Varnish Software, the company behind the popular open source HTTP accelerator, sponsored the book and has exclusive rights for a month. 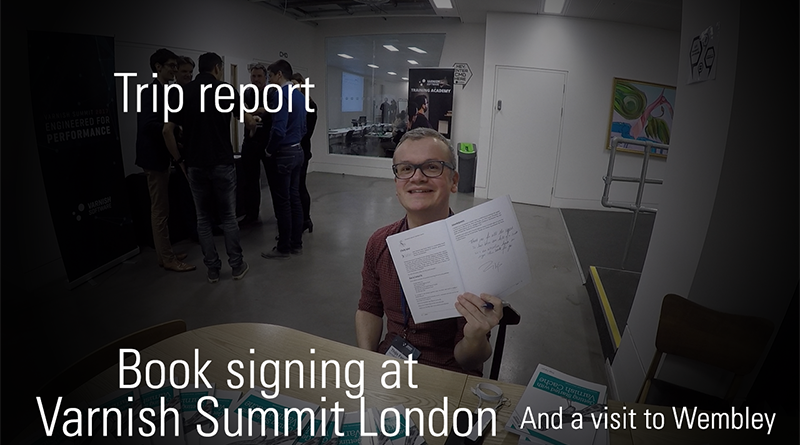 They invited me to present my book at the upcoming Varnish Summit in London and they also organized a book signing. A book signing? Who cares about that? I’m quite self-conscious and I’m well aware that people will not be attending the summit just for my book. During the summit, physical copies of my book were handed out and I signed a couple of those. By now, I have gotten the hang of it and I feel confident enough to sign a book and to include a personal note. The book signing was the goal of my stay in London, but the trip itself definitely adds to the experience. Check out the video of my trip report. I’m an SPG Gold member and I like to be loyal to their brand. It’s in my own best interest. Starwood Hotels also has a brand called Tribute Portfolio. It consists of independently run hotels that still get you SPG privileges. My previous trip included a stay at Town Hall Apartments, which was brilliant. This time around, I chose to stay at The Great Northern Hotel. The hotel is located inside King’s Cross hotel and could best be described as contemporary classic. The location was super convenient for a quick stay, due to its proximity to the Eurostar terminal. It was quite posh, but the room I booked was tiny. Honestly, I didn’t mind. All the facilities were there, it was comfortable, it was stylish and the shower was great. The Varnish Summit is a corporate event that Varnish Software organizes to showcase technical content to its customers, partners and prospects. I’ve spoken at a number of these events. I was invited again to teach people the basics of Varnish and plug my book at the same time. I usually get invited because of my engaging presentation style, because there’s no way I can outsmart the Varnish engineers who are also presenting at the event. My content is targeted at developers, which is a great audience for Varnish. Besides the typical technical issues (projectors, dongles, …), the presentation went really well. After the talk, I did the book signing, where I had pleasant conversations what all kinds of people. After the formal part of the day, I took the tube to Wembley park to attend a Europa League game between Tottenham Hotspur and KAA Gent. It was more of a coincidence than anything else: some of my colleagues mentioned the game and I noticed I was in London. I bought a ticket, I attended the game, I saw some scenes. It made me happy. For the record: I work in Gent, a lot of my colleagues support KAA Gent, I don’t. I support their rivals: Club Brugge. I’m not a hater, I was impressed with their support. They outclassed the Spurs fans. Honestly: it was an away game for both teams, because Spurs weren’t allow to play their home stadium due to construction work. The result was a 2-2 draw, which was enough for Gent to qualify for the next round. I was a neutral spectator and enjoyed the game. I can now say that I visited the holy ground, the home of football. It was a busy, but enjoyable day, both on a personal and professional level. I’m super proud of my book and I’m happy that I got my hands on the first physical copies. The book signing was great too, although I felt a bit uncomfortable at first. I met some interesting people, at good food and enjoyed my evening at Wembley.